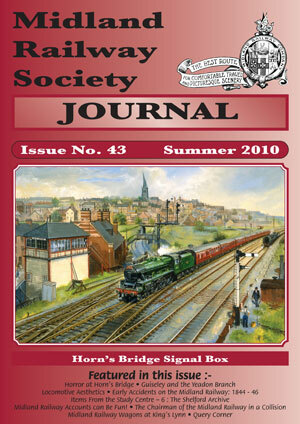 Cover photograph : Our cover photograph is a reproduction of a fine painting by David Charlesworth depicting ‘Jubilee’ class 45561 Saskatchewan at Horn’s Bridge, Chesterfield, at the head of an up express. The period illustrated would be around 1960. 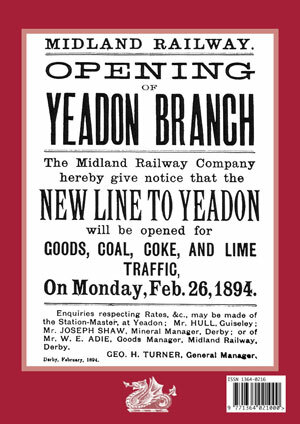 The Jubilees were, of course, regularly seen on expresses on the Midland main line, and this picture is full of Midland style. It is the first of what we hope will be regular coloured images for the front page of our Journal, and it introduces the article by Roger Brettle describing an assault upon the signalman at the box at Horn’s Bridge. The assault took place in 1876, when the box was the first that the Midland erected here. Unfortunately, there appears to be no photograph or image of it that has survived, or indeed was ever made, so we have used illustrations that contain, as here, its replacement, on the same site. Cover photograph : This beautifully composed photograph of South Wingfield station, rich in winter colours, was taken by Steven Lee in January 2008. Apart from being a very lovely image in itself, its depiction of architectural decay wrings the heart of anyone who cares about the state of our railway heritage. Although South Wingfield station has a Grade II listing, it has been allowed to fall into serious disrepair over many years by its present owner. 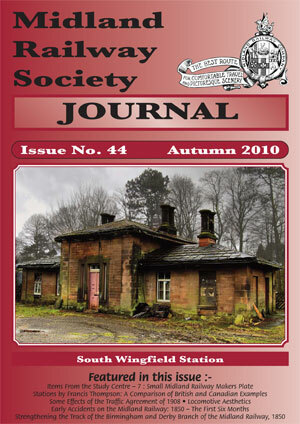 The loss of any Listed building always diminishes a cultured society, but losing South Wingfield station would be a unique blow. For the building is the only remaining example of the extraordinary set of exquisite stations designed by Francis Thompson for the North Midland Railway. Its seriously degraded condition has prompted moves towards compulsory purchase by Amber Valley Borough Council, and we can only hope that soon it will be made safe and water-tight, and, perhaps, let to a suitably sensitive user. 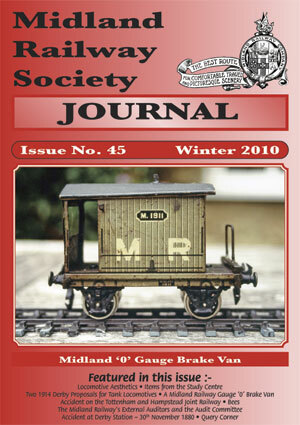 Cover photograph: Although appearing crude in comparison with modern ‘0’ gauge models of similar vehicles, this tin plate model by Carette of Nuremburg of the D390 Midland goods brake van would have seemed extraordinarily good to those fortunate enough in 1911 to be able to buy it. Even now, given the limitations of the modelling medium, the model is highly authentic, in dimensions, livery and detailing. Any ‘Midland’ enthusiast of the time would have been enraptured by it. George Huxley, the present owner of this model, provides some background to it, and to the relationship between Bassett-Lowke of Northampton and Georges Carette of Nuremburg that brought such models to Britain. 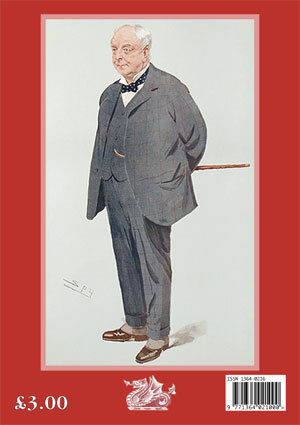 Back cover: Our back cover depicting Sir Arthur Bass, Bart, 1st Lord Burton, was drawn by Leslie Ward and first appeared in Vanity Fair, November 1908. Sir Leslie Matthew Ward (1851 – 1922) was a well-known portraitist and caricaturist of the time, publishing under the pseudonyms of ‘Spy’ or ‘Drawl’. 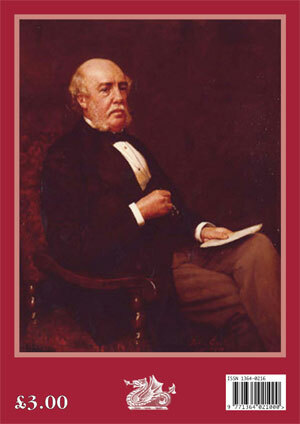 Lord Burton was elected to the Audit Committee of the Midland Railway in August 1891, serving on it until his death in 1909. He is just one of the many experienced and prominent men upon whom the Midland drew to perform the essential functions of auditing a large and complex company. Roger Brettle’s article describes the function of the MR Audit Committee and provides a snapshot of those who worked within it. This important aspect of MR working has hardly been touched upon, and Roger’s article is a step towards putting that right. Its appearance now is especially illuminating, when we are all beginning to suffer the consequences of the recent disregard of honest and ethical auditing of large and powerful financial institutions. Like his father (Michael Thomas), Michael Arthur Bass was a generous benefactor to Burton, making many fine contributions to the town, including the Ferry Bridge, the St Paul’s Institute and Liberal Club (now the Town Hall) and St. Chad’s church. A bronze statue of Lord Burton, sculpted by F. W. Pomeroy, was erected in front of the Burton Town Hall in 1911.